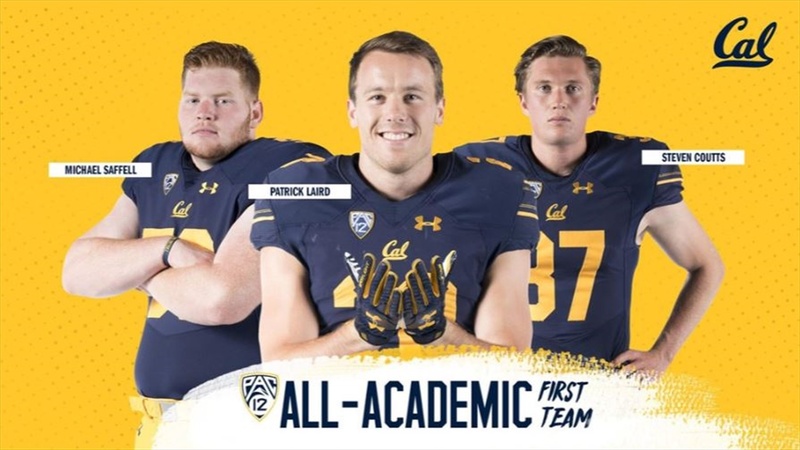 SAN FRANCISCO – Patrick Laird (Business Administration/Political Science Double Major, 3.58 GPA), Michael Saffell (Undeclared, 3.54 GPA) and Steven Coutts (Education (Master’s), 3.62 GPA) earned first-team honors to lead a group of 11 Cal student-athletes selected to the 2018 Pac-12 Conference Football All-Academic teams announced Monday by Commissioner Larry Scott. Jake Curhan (Undeclared, 3.41 GPA) was a second-team selection. Siulagisipai Fuimaono (Undeclared, 3.18 GPA), Chase Garbers (Undeclared, 3.29), Ryan Gibson (Political Science, 3.01 GPA), Chris Landgrebe (Industrial Engineering, 3.03 GPA), Malik McMorris (American Studies, 3.09 GPA), Chinedu Udeogu (Undeclared, 3.02 GPA) and Ricky Walker III (Undeclared, 3.24 GPA) picked up honorable mention honors. To be eligible for selection to the academic team, a student-athlete must have a minimum 3.0 overall grade point average and appear in at least 50 percent of their team’s games although injury or illness does not count against criteria to appear in 50 percent of a team’s contests. Laird is a two-time first-team selection, and also earned a second-team spot in 2016. This also marks Curhan’s second straight second-team honor. Saffell, Coutts, Fuimaono, Garbers, Gibson, Landgrebe, McMorris, Udeogu and Walker III were each honored for the first time.